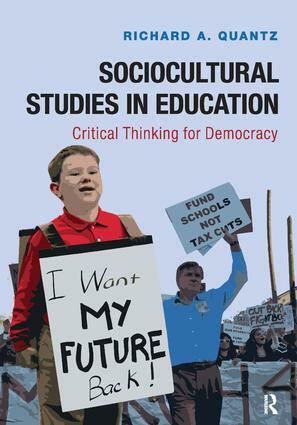 Sociocultural Studies in Education: Critical Thinking for Democracy fills a void in the education of educators and citizens in a democracy. It explores some of the fundamentals around which disagreements in education arise. It presents a process with which those new to these debates can understand often confusing and entwined sets of facts and logics. This book leads the reader through some general concepts and intellectual skills that provide the basis for making sense out of the debates around public education in a democracy. This book can be seen as a primer on how to read texts about education. It acknowledges that good teachers must be not only trained to teach, but also educated about education. It presents the various themes and currents found within the arguments and narratives that people use to represent public education. It assumes that the more those interested in education know about how to see through the rhetoric, the better they will be at discerning whose interests are served by which texts.